The Infinity Galvanized Fire Ring is an ideal solution to keep your fire contained. The ring allows a 360-degree view of the flames. The classic wave style on this solid galvanized steel ring will blend seamlessly into any outdoor background, while the large 36" diameter allows for plenty of firewood to get your party started. In addition, the galvanized finish prevents rust. Grab your marshmallow skewers and s'mores ingredients and head to the fire ring for a night of fun. The 27" Burner is a freestanding fire feature that is designed for custom applications in both indoor and outdoor uses. It allows you to add flames virtually anywhere for a luxurious and unique space. It is equipped with a flame regulation mechanism. This fireplace will burn for approximately 5 hours with 1 fill of superior quality bio ethanol fuel. Included in the box is an easy pour spout. This unit comes with a 3 Year Manufacturers Warranty. The Napoleon Patioflame Table Windscreen for St.Tropez & Kensignton models keeps your flames safe from the wind and keeps your flame patterns from being disturbed. The screen is made from clear, tempered glass. It's not only strong, but highly-durable and long-lasting. The sides are five-inches high, tall enough to keep your flames safe on even those windy days. It comes with metal clips and rubber feet that hold the screen in place and keep it from sliding. The Bellora Fire Pit is the perfect accessory for your outdoor patio. Decorative accents located on the sides of the bowl are highlighted with a rubbed bronze finish. The 13 inch deep, 28 inch diameter fire bowl features the CirculAir system which raises the fire wood and allows oxygen to circulate for a longer lasting fire. When the fire pit is cool, it's easy to move your pit with the attached ring handles. The fire pit includes a mesh cover to help prevent escaping sparks, a cooking grid for grilling and a poker to tend the firewood. Infinity 36-inch Galvanized Outdoor Fire Ring The Infinity Galvanized Fire Ring is an ideal solution to keep your fire contained. The ring allows a 360-degree view of the flames. The classic wave style on this solid galvanized steel ring will blend seamlessly into any outdoor background, while the large 36" diameter allows for plenty of firewood to get your party started. 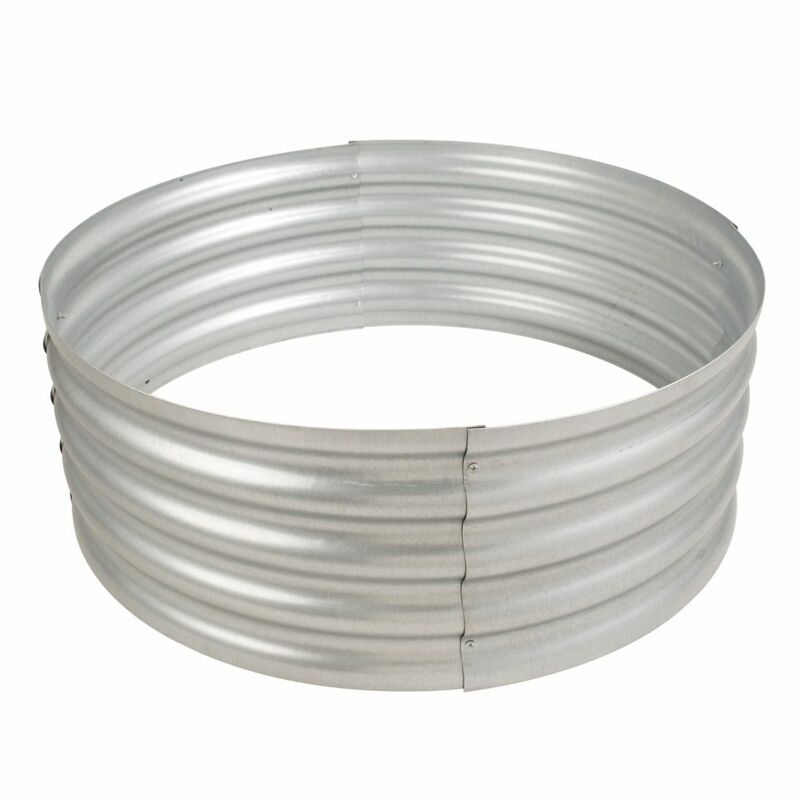 In addition, the galvanized finish prevents rust. Grab your marshmallow skewers and s'mores ingredients and head to the fire ring for a night of fun. Infinity 36-inch Galvanized Outdoor Fire Ring is rated 4.8 out of 5 by 65. Rated 5 out of 5 by DLG from We are very pleased with the wood fire ring. It was so easy to assemble and is very sturdy. We in... We are very pleased with the wood fire ring. It was so easy to assemble and is very sturdy. We installed it and built a stone surround. It is being used primarily for yard debris and leaf burning but we are looking forward to using it for entertaining and cooking very soon! Rated 5 out of 5 by Anonymous from Easy to put together and durable for fire pit use. Easy to put together and durable for fire pit use. Rated 5 out of 5 by UrbanGirls from Love it so much that it is my 4th purchase... Love it so much that it is my 4th purchase and I used it as a raise bed garden. Sturdy and well made. Highly recommended. Rated 5 out of 5 by Christine from It is great! Very happy with it. ... It is great! Very happy with it. Could you join 2 of these to make a larger ring? They are preformed and heavy gauge steel so doubt it. That said it's already a pretty good size and anything bigger might draw the attention (and ire) of the local fire marshal.